Cyclique est une installation composée d’une matrice de 256 ballons gonflés à l’hélium. Les ballons équipés de LEDs sont les interprètes d’une composition musicale et lumineuse. In 1958 a World’s Fair was held in Brussels, Belgium and to mark this monumental occasion they built the Atomium. Designed by André Waterkeyn its structure—steel-clad spheres connected by tubes to form a square—mimics the structure of an iron crystal magnified billions of times. Fast forward 55 years and now, inside this iconic building, resides a light installation called -Infinity, a collaboration between Joanie Lemercier and Visual System. It’s part of a summer exhibition entitled ID#2013 Poème Numérique inspired by Le Corbusier and Xenakis’ innovative video installation Poeme Electronique which featured at the 1958 Expo. 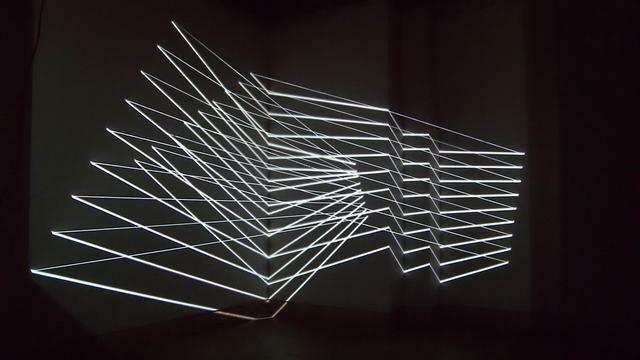 For the site-specific installation -Infinity the artists investigate « the spatial qualities of light ». Sticks of LEDs ride up the interior of one of the spheres, augmenting the structure and responding to sounds and tone—this is complemented by a « polygon planet » suspended from the ceiling, built by Joanie Lemercier as a cardboard origami structure which has visuals projected onto it (text by Kevin Holmes). Always/Never est le résultat de récentes recherches de UVA sur la perception du temps. L’installation une grille d’éléments pyramidaux inspirés par du cadran solaire : chaque passage à travers le temps à un rythme différent. 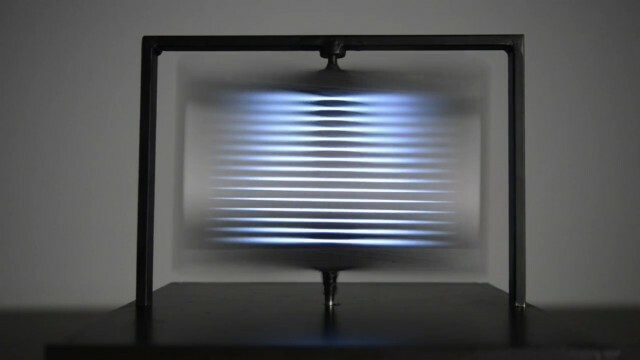 L’évolution des modes de lumière et d’ombre créent l’illusion d’une surface liquide; combinaisons changeantes de couleurs de la nature rappellent des moments différents de la journée. Always/Never is the result of UVA’s recent investigations of the perception of time. 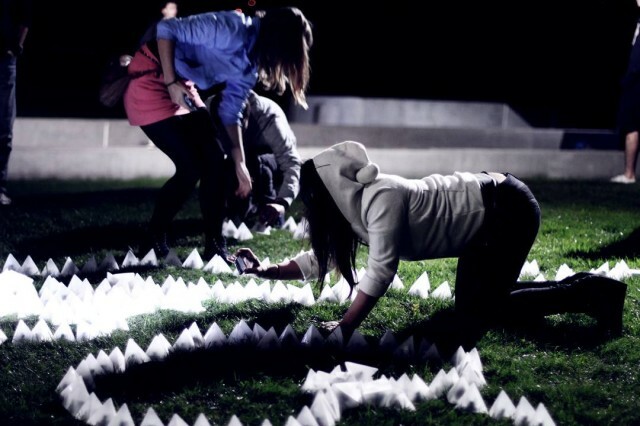 The installation is a grid of pyramidal elements inspired by the sundial, each passing through time at a different rate. Changing patterns of light and shadow create the illusion of a fluid surface; shifting combinations of colours from nature recall different times of day. 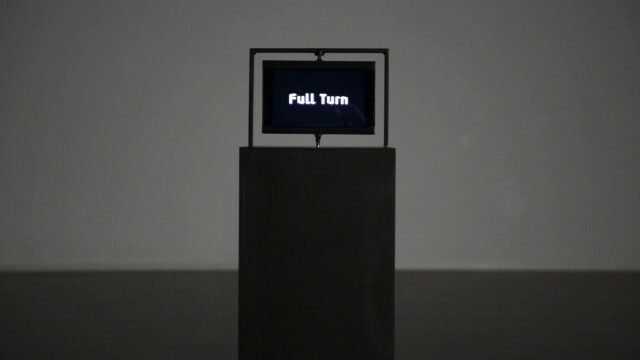 Cette sculpture est le projet d’un étudiant de l’ECAL (École Cantonal d’art de Lausanne) en Design & media interactif. Il s’agit de deux écrans assemblés dos à dos qui tourne à très grande vitesse. First installation of the Sound of Threads exhibition in June 2013 in Reykjavik. Sound of Threads is a structure of wood and threads of wool, where light is projected to visually translate the music and enhance the sound. 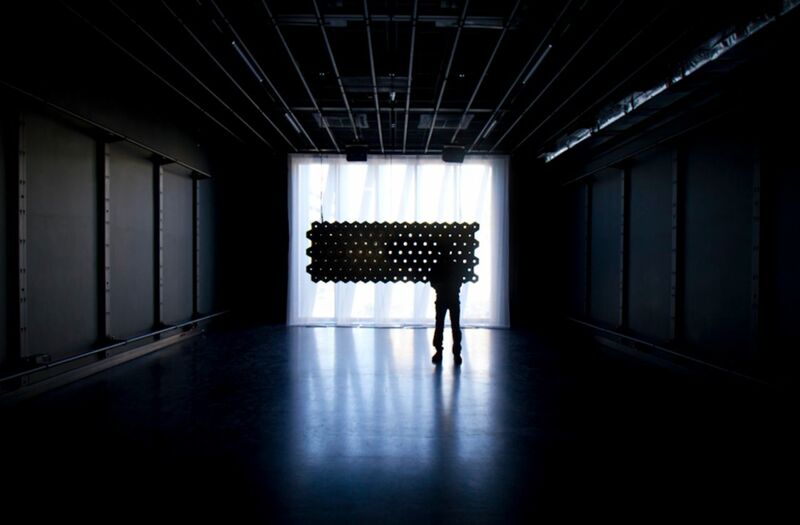 installations, both engaging with sound’s impact in multiple ways, so that people could both feel and create music, by hearing, touching and seeing the sound. I tried to demonstrate the power of our senses when they interact in being « triggered » simultaneously. I was interested in questions of how sight can enhance hearing, or also disturb our balance in perceiving a multimedia-based bodily experience. 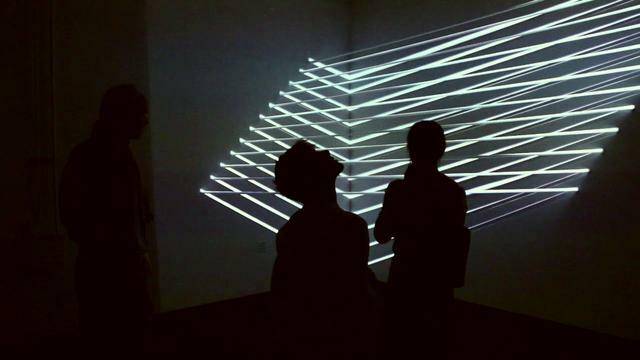 The main part, and first to be seen, when entering the exhibition, was an installation consisting of four wooden stands and white threads of icelandic wool, where light was projected on in a way to visually translate the music and extend the sound experience of the prepared sound piece. The second part was a tiny room where people were invited create their own „music piece“ merely by their bodily existence. In touching wires, that were hanging from the ceiling, and by walking and dancing bare foot in this room, my specific material setting accounted for temporarily closed electric circuits that started single samples of the outside presented piece of music. And all based on the random performing of all the visitors and their conductive human bodies. Additionally each sound was connected to multi-colored light impulses, projected on large, flaglike pieces of transparent fabrics, that were also hanging from above. The two installation were visually and in their structures arranged quite differently. The main piece was black and white, with really thin ray of light choreographed on a soundtrack, the other was an instrument where the visitors made their own piece of sound, and was really colored on this large pieces of fabrics. But this two pieces were also tightly connected by using the same voices and sounds, and they both wanted to show this link between our different senses. 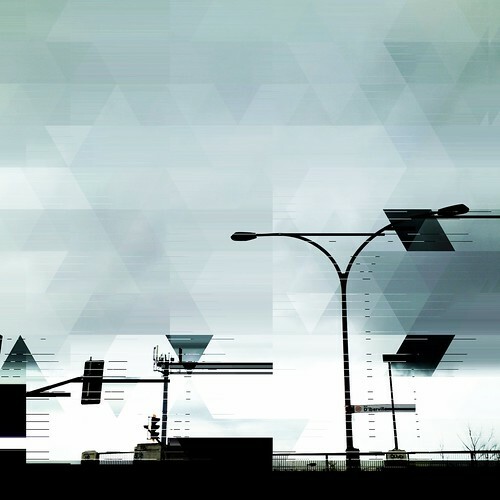 Scénographie designé par Iregular pour le festival Mutek à Montréal en juin 2013. 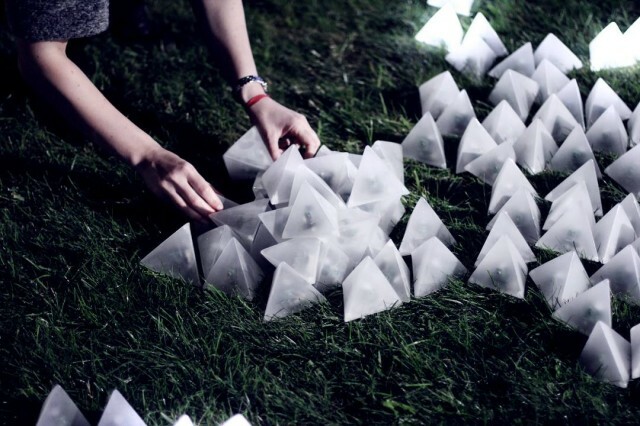 Scenography designed by Iregular for the Mutek Montreal festival 2013. Ce projet met en œuvre une structure à facettes placé sur un socle pour créer une interaction avec le contenu en le touchant. L’installation permet différentes formes de représentations et d’interactions à explorer avec un écran solide. 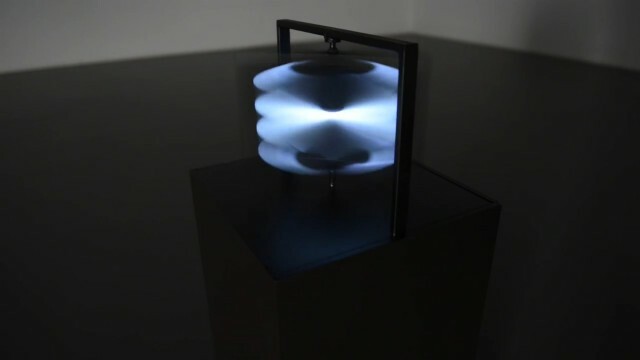 Pour que la forme devienne une surface de visualisation multi-touch, il était nécessaire de concevoir une forme plastique thermo-formé semi-transparent qui permet la projection et la détection des doigts à l’intérieur de la structure. J’ai ensuite fait une structure en acier soudé qui soutient le système de projection et la détection de la forme. Le logiciel utilisé permet une détection avec un dispositif d’affichage qui est spécifique aux faces et leurs orientations. This project implements a faceted structure placed on a plinth to support the content, which permits interaction with the content by touching it. 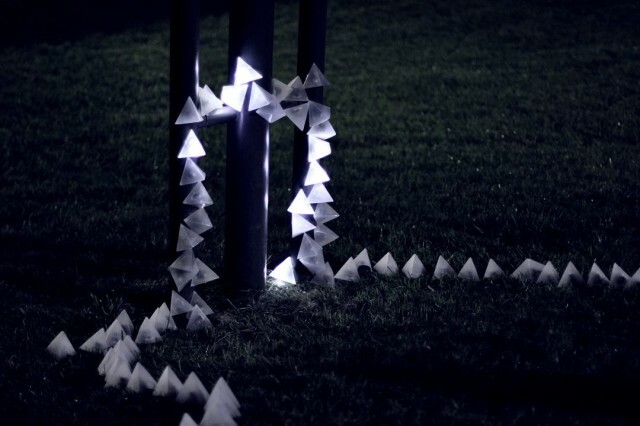 The installation allows different forms of representations and interactions to be explored with a solid display. 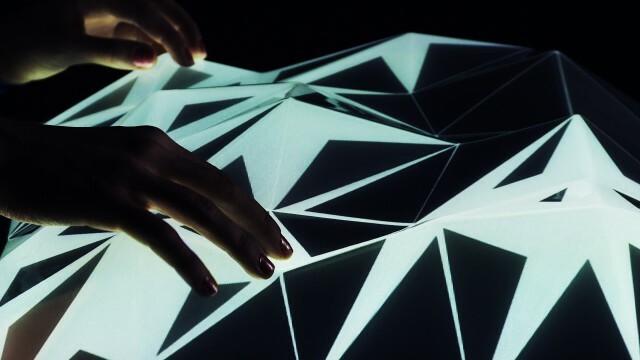 In order for the shape to become a surface of multi-touch visualisation, it was necessary to design a shape in heat-welded semi-transparent plastic which allows the projection and detection of fingers from inside the structure. I then made a structure in welded steel which supports the system of projection and detection on the shape. Installation interactive de Annica Cuppetelli et Cristobal Mendoza qui consiste en structure de spandex illuminée par une projection interactive qui réagit aux mouvements des spectateurs. Nervous Structures est une série d’installations interactives projetées sur des structures de tissu qui réagissent à la présence et au mouvement du spectateur. » Notre travail porte sur l’espace, mais nous tentons de répondre à de multiples directions: l’espace entre le réel et le virtuel, entre ce qui existe et ce qui est ignoré, entre le sensuel et le logique, entre nos corps et les structures physiques qui nous entourent . Ainsi, notre travail est également basé sur l’interaction; sans qu’un participant nous considérons nos pièces incomplètes. Le « Water Light Graffiti » est une surface composée de milliers de LED éclairés par le contact de l’eau. 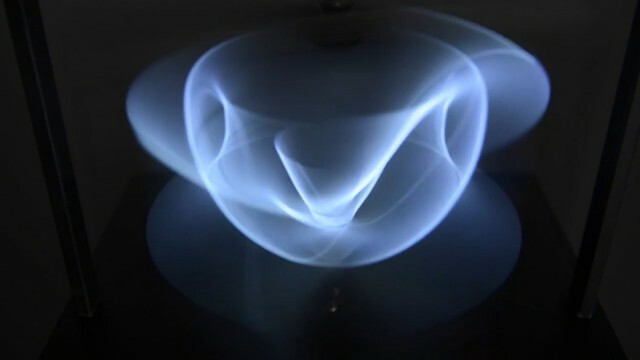 Vous pouvez utiliser un pinceau, d’un atomiseur d’eau, vos doigts ou quoi que ce soit humide pour esquisser un message luminosité ou tout simplement à dessiner. Light Water Graffiti est un mur de messages éphémères dans l’espace urbain sans détérioration. Un mur de communiquer et de partager comme par magie dans la ville. The « Water Light Graffiti » is a surface made of thousands of LED illuminated by the contact of water. You can use a paintbrush, a water atomizer, your fingers or anything damp to sketch a brightness message or just to draw. 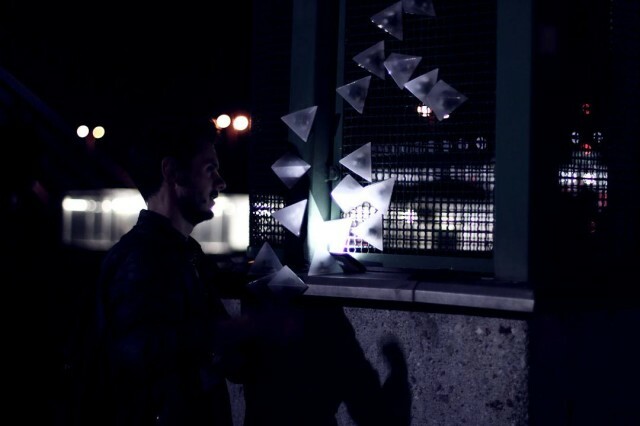 Water Light Graffiti is a wall for ephemeral messages in the urban space without deterioration. A wall to communicate and share magically in the city. 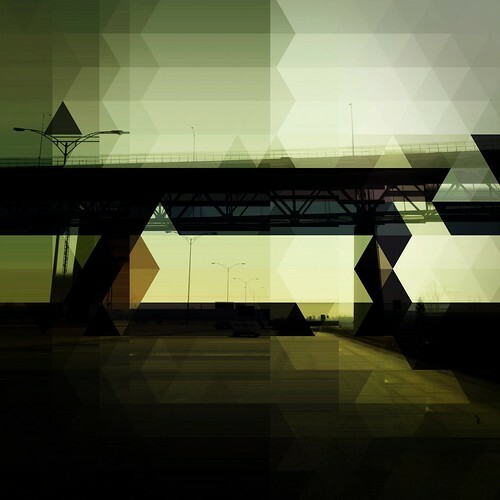 Tagué generative content, light, lines, live, mavideoz, photo, photography, trace, trace photography, triangles, vj ma"